Are you looking to leave an unforgettable impact on your guests? If you want that extra personalization, then some level of lighting design is the way to go. 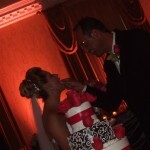 Besides Michigan DJs and Michigan photo booth rentals, we also specialize in dynamic uplighting. Statistics show that 80% of our clients go with lighting for their event. By “lighting design” we mean that your walls can match with over 16,000,000 colors. We can also provide room draping, static decorations, and image projections. First we will decide on the colors to paint your room. The brighter the colors the greater the effect. We can match with any pallet of colors, all that we require is a color swatch. The most common solution we do for events is wall uplighting. This is accomplished by placing energy friendly LED lighting fixtures around the base of your walls. Since our lighting is computerized, it can match with your theme or slowly fade during the initial stages of the event. During the dancing portion of the evening, lighting changes to the beat of your music. This level of sophistication is something that guests are not familiar with. 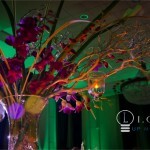 With Light Up My Event, our goal is to over exceed your expectations. We take our light shows above and beyond what traditional companies provide. Most of the time, they will address a light fixture to a static color and it will stay that same color for the duration of your party. We include a lighting designer on-site with every package. They are there to assist and control software that runs our lighting. We can keep the colors more conservative for the beginning of your event. However, once the dancing starts lights can change color with the mood of your event. So if guests are singing at the top of their lungs, we can black it out on the chorus. It can strobe during the breakdown of your favorite song. If Al Green is being played, your whole room is green. You can request any style of control from static colors to over the top. We spent 10 hours a day for 3 months straight programming our show… we’re pretty intense. What do you want guests to think when they sit down at their tables? Centerpieces can tie together your theme and pin-spotting your tables will make sure guests notice your effort. This is achieved by aiming powerful LED lighting on your centerpieces. Fixtures are easily hidden in the corner of your room and positioned to prevent the glare from getting into your guests eyes. Some clients combine crystal bead strands with branches in elevated vases. Doing this will capture and reflect the lighting fixtures making your whole room shine like diamonds. To produce this dazzling effect, we recommend (1) pin spot per table. Trust me, guests will notice all the time you’ve dedicated to your centerpieces. Think outside the box with lighting and highlight unconventional areas. Just picture all your tables lite up in the color of your choice. We use specialized fixtures to accomplish table lighting. They are remote controlled meaning we don’t need a data cable to control it. In addition, it has a dedicated power source that lasts up to 10 hours. There will be no wires or cords coming out of the fixture, keeping the setup clean. This will be a static controlled fixture, meaning it will stay the same color for the duration of the event. You can choose from over 16 million colors. There are so many places you can use this approach. The most noticeable place to have lighting is under the head table. This is the focal point of a room and a majority of photos will be taken with this as a backdrop. Besides the head table, you can even light up cocktail tables and guest tables. If you are looking to light up your tables, we suggest you use a light weight white linen. It will be easier to saturate with color and be visible to your guests. People are curious and they will wonder how you managed to pull off this look. It will turn out to be a conversation piece at your event. One of the most important factors with lighting design is keeping your room well balanced. A ceiling wash is the most over-looked element with lighting decor. This works best in facilities that have high ceilings and outdoor tented events. The higher the ceiling the more efficiently your colors will blend. A majority of clients use a secondary color for the ceiling to compliment the primary color (video example below aqua walls and pink ceiling). Since these fixtures are computer controlled, you ceiling will change color as the night unfolds. Another benefit of a ceiling wash, is that the fixture can doubled as a follow-spot for award ceremonies, grand entrances, and public speakers. Give an old world feel to a modern event. Bistro strand lighting makes it feel like you are walking down an cobblestone path in Italy. We use high quality antique style globes, which automatically give a warm vibe to your space. They can be used either indoor or outside, and displayed in a variety of ways. Just like ceiling drapery, we have to make sure there is a way to safely hang and suspend the strands. Each individual light strand has dimming capabilities, so you can dial in the intensity to your preference. The electrical cords are black and their neutral color will help them blend into your locations atmosphere. To get a better idea of how our lighting strands look, click on our images above.